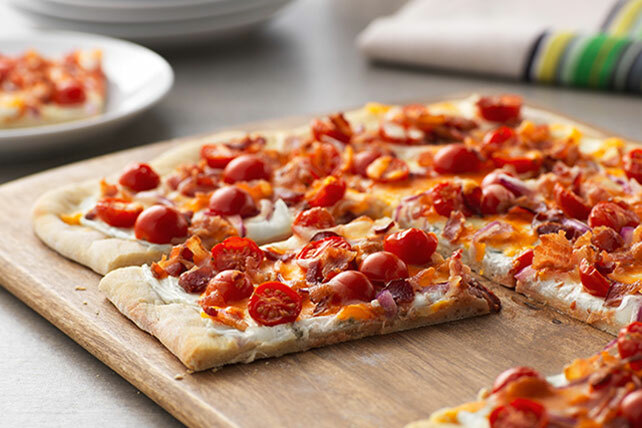 Cream cheese flecked with jalapeño adds heat to this crusty BOT (bacon, onion and tomato) flatbread. Check out the video to see how easy it is to make. Pat pizza dough into 16x12-inch rectangle on lightly floured baking sheet. Bake 10 min. Spread crust with cream cheese spread; top with remaining ingredients. Bake 10 to 12 min. or until shredded cheese is melted and edge of crust is golden brown. Serve with smart sides, such as your favorite hot steamed vegetable or a crisp mixed green side salad. Substitute drained canned pineapple tidbits for the halved cherry tomatoes. Prepare using thawed frozen pizza dough.